LOD can be set with the command /minlod. Max is 250. Using CubeScript one can customize their binding even further. See the TuxArena Guide or this thread for examples. See the README file for further details. 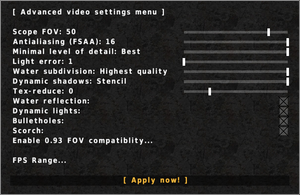 Build is a beta version; it's most notable issue is that the gamma causes color issues if set to anything besides 100. Use command /gamma 100; resetgl to reset if you get issues. Disables the sound file that causes the problem. Forces the game to use OpenAL soft. Protox HQ Reskin offers high detail player models while Protox Mod offers high detail HUD items. A simplified version of Protox Mod can be found here. Alternative Flag Animation replaces the flags in CTF game mode with higher quality versions. Real Sound Pack makes weapon sounds more realistic and immersive. Note that this pack is quite old and instructs you to install it by overwriting the original game files; do not do this! Install it like any other mod: place the weapon folder inside a packages\audio sub directory. Also only the files usp, sub, auto, grenade_exp and sniper are used, the rest can be deleted. Also note that in newer versions you may have to convert the files to ogg format. 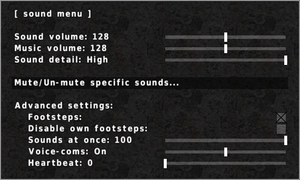 Reloaded Sound Pack like the above, was created for an older version of the game but features higher quality sound effects. 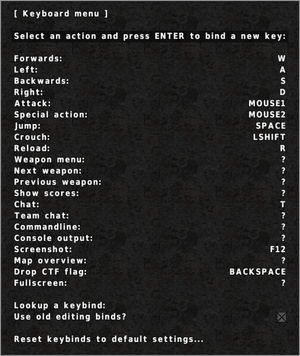 To make it work correctly rename the weapons folder to weapon, then move the clip_empty file from the misc folder to the weapon folder. For the change_gun file do the exact opposite, move it from weapon to misc. Then rename the bolt file in the weapon folder to sniper. You can also delete the rpg file as it is unused in the latest versions. Like the previous pack you may need to convert the files to ogg for them to work properly. This page was last edited on 9 November 2018, at 23:04.